Black List, The - Every December, The Black List surveys over 600 production company and film financier executives about their most liked not yet produced screenplays and aggregates responses for the industry and the public. The Black List is where filmmakers find great material to make films and great material finds filmmakers to make them. Over 225 Black List screenplays have been made as feature films. Also see Wikipedia. Creative Screenwriting - Articles, daily, from screenwriting journalists in Hollywood and around the world. Diary of a Screenwriter - Notes on writing for film. Hollywoodscript - Script consultants site with extensive resources for screeenwriters. Internet Movie Script Database (IMSDb) - Read, download movie scripts for free. My Dinner with Andre - The full screenplay written and performed by Andre Gregory and Wallace Shawn. New York Screenwriter Monthly Online - Articles, the Screenwriter's Guide to Making It, interviews, script competitions, resources and writer's links. Screenwriting.info - How to write a screenplay in format and style. Screenwriter's Utopia - Dedicated to screenplay writing and screenwriting elements on how to write a screenplay in proper format, classes, and interviews with professional screenwriters and news. Screenwriters Resource Center - A screenwriting software and screenwriters resource. Script Frenzy - An international writing event in which participants take on the challenge of writing 100 pages of scripted material in the month of April. 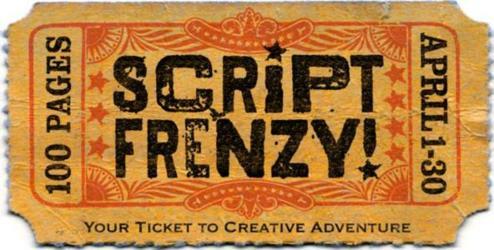 As part of a donation-funded nonprofit, Script Frenzy charges no fee to participate; there are also no valuable prizes awarded or "best" scripts singled out. Every writer who completes the goal of 100 pages is victorious and awe-inspiring and will receive a handsome Script Frenzy Winner's Certificate and web icon proclaiming this fact. Scriptologist - Online magazine that shows screenwriters how to write and sell screenplays to Hollywood. Scriptmag - Online community of for screenwriters. Industry news, chats, books, events calendar, contests, newsletter. Scripts-O-Rama - Free film scripts, transcripts, and drafts. Simply Scripts - Links to hundreds of scripts, screenplays, and transcripts of current, classic and soon-to-be-released movies, television, anime, and radio shows. The Writer's Network - Script analysis service. Writer's Guild of America - Sreenwriting for screenwriters. Writers Store - Specialty source for script writing software, screenwriting and story software and books featuring Final Draft, Movie Magic Screenwriter, and Dramatica Pro software for prose and script writing. Seminars, books, software and resources for screenwriting, screenplay, TV, sitcom, and stage play script writing, creative writing, dramatic story structure character, and plot development, novel, comedy and fiction writing, and film production scheduling, budgeting software and supplies. Zoetrope Screenplay Submissions - Francis Ford Coppola's American Zoetrope accepts submissions of feature-length screenplays. American Zoetrope staff, who are always looking for good new screenplays to produce, will read the best-received screenplays. As a participant you will receive the benefit of seeing your work reviewed and discussed by a diverse group of writers from all over the world. This webpage last updated on Monday, January 2, 2017 1:15 PM.